Food webs might seem clear to you—grass grows in the sun, cows eat the grass, you eat the cow, you play on the computer. But it doesn’t always work that way in the animal kingdom. Today’s word of the day is kleptopredation, a new way of eating that was recently discovered in a species of sea slug by researchers in Europe. Kleptopredation’s existence shows that there’s more to predator-prey relationships than just predator-eats-prey, according to the paper published today in the journal Biology Letters. 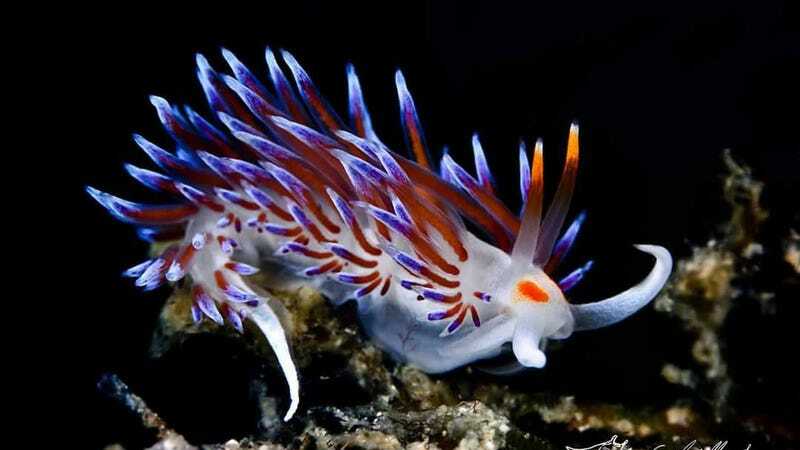 The researchers collected the sea slugs, called nudibranchs, as well as some samples of jellyfish relatives called hydroids and plankton, from the water near Sicily. The experiment simply involved watching the nudibranchs make their eating decisions, choosing between hydroids that had just eaten plankton and those that hadn’t. The nudibranchs selected the recently fed hydroids more often at a rate highly unlikely to be random. 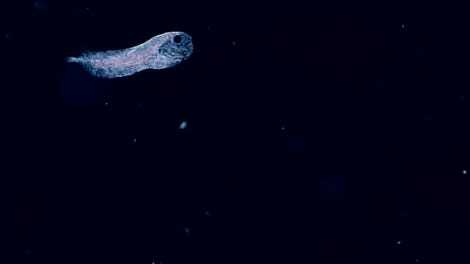 And unlike you and cows, it turns out that around half the nudibranch diet comes directly from the plankton by eating in this way, the researchers write. “The strong behavioral response of the nudibranch to fed hydroid colonies in the prey choice experiment suggests that nudibranchs will, by preference, consume hydranths that have captured and are handling prey,” the researchers wrote. This experiment is limited by the fact that it’s just a couple dozen trials performed in a lab and not necessarily how things happen in real life. And maybe the nudibranches were just opting for the plumper hydra. But the experiment’s results shouldn’t be that surprising. Mary Roach describes a similar eating habit in Inuit people in her book Gulp. Arctic dwellers rely on organ meat and even caribou stomach contents for certain nutrients in places where there are few fruits or vegetables available. Ultimately, kleptopredation shows that food webs are complex pathways where energy and nutrients travel between plants and animals—far more complex than just big fish eats little fish. Update 1:00PM EST: James Newcomb, a biology professor at New England College not involved with the study, agreed that an animal relying on stealing food ingested by another organism was a cool concept. He felt the results were tantalizing but not yet convincing—there could be other explanations.